Moving through the day has its share of ebb and flow. Within that time frame, you can encounter a lot of people, work and energy that needs moved around in the body. Simply sitting still can cause stiffness and a need for movement. Even as a yoga studio owner, get stuck in front of a screen for long stretches (pun intended). At times, I get up, walk around, do laundry to step away for a moment. And yes, I even sneak in movements I know to shift things around in my body. 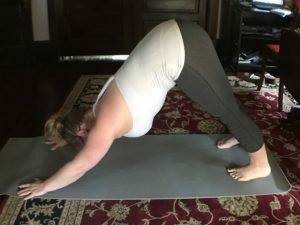 So here are 5 yoga postures I practice (probably daily) throughout my day to bring a little stretch and movement in. A great posture for soothing the mind and body, breathe deeply into it and allow the sensation to travel around the spine! No need to have the heels touch the ground in this pose. Focus on pressing the earth away like a heavy piece of furniture. 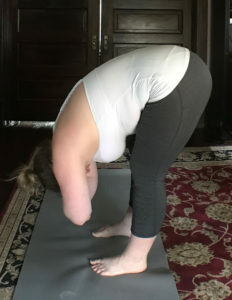 The power in this pose comes from the upper body, specifically around the ribs. 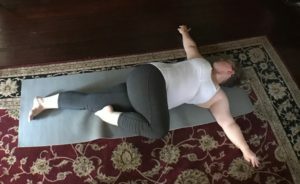 Hinging where the legs meet the pelvis, this deep fold stretches out the posterior (back side) of the body. An option if your back is exceptionally tight that day, is to rest your elbows on your needs. Rocking the hips from side-to-side can also help in either variation. 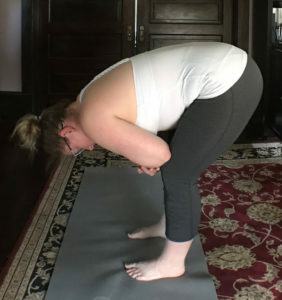 This posture is a variation of Standing Half Moon. It gets right into the side ribs on both sides of the body. Ground through the feet and pelvis maintaining a little bend in the knees for a more stable posture. This posture have been a favorite for quite some time. I have yet to find a twist that feels as complete as this one! The key is to keep the shoulders planted in the ground and adjust the hips for a fuller twist. Also, dont reach the knee down, reach it toward the wall its pointing at for a better experience. What are some of your favorite yoga postures for a quick energy boost! Leave them in the comments below!